Common problems that we are finding in a typical St. Augustine lawn this season include fungus, chinch bugs, sod webworms, fire ants, and weeds. To maintain your lawn this season, make sure you check the numbers on the fertilizer bag before application. The first 6 months of the year, you want to make sure your Nitrogen (N) levels are higher than the other numbers on the back to encourage vertical root growth, strength, and color. The last 6 months of the year, you want to make sure your Potassium/Potash (K) levels are higher in numbers than the rest. For example, a good application rate for the first part of the year can be a 24-0-11 or a 16-4-8, and the last part of the year a good example will be like a 9-0-24. The potash/potassium in the fertilizer helps for root strength and for lateral growth within the yard. Potash will remain in the runners to promote a longer green color through the winter time. It is very important to apply a heavier potash amount in this time of year. This will also help aid in the repair of the damage caused by fungus. To identify damaging insects in the yard, an inspection is required. Do not look at the damaged areas in the lawn, but around the fringes to inspect for the culprit. Move the grass to see the soil and look for small black insects with small white markings on their backs, or red small nymphs at the root level. If found, you have chinch bugs. They have also been seen running across the sidewalks when a heavy infestation is present. You will need to treat the whole yard with a PROFESSIONAL insecticide to cure. They have shown a resistance to watered down Home Depot products, so make sure to get the good stuff! We recommend Allectus insecticide to cure. To identify Sod webworms in the lawn, walk through a shady area of the lawn and look for little flying white moths. These are the adults that are laying all kinds of eggs that when they hatch, the nymphs will be chewing on the runners making them start to deteriorate. A small brown patch and steady decline in the shady areas will be present. 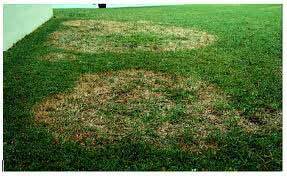 You will need to treat the whole lawn with a professional grade insecticide to cure. Fire ants are reproducing right now and have made it inside our homes and offices. It is important to treat the whole yard to keep these guys are bay. They will intrude expansion joints, cracks in the stucco and eventually get inside the home. They do bite and they will get into your clothes if the opportunity reveals itself. They eat proteins and carbohydrates that include skin fragments, crackers and so forth. Treating the outside with a chemical such as Termidor will keep them away for at least one year.